Friendly staff helped a lot for guest's sudden request. Better to take taxi or Uber but walkable if you don't have big lugguage like 15 min. Very safe and comfortable to walk alone late at night from the bus station women alone Hot Shower was good. Room was clean and bed was comfy. Recommendable! Hostel Viva was fantastic and I highly recommend it. The thing that stands out is the level of great customer service. Before I had arrived I was at the Belarus embassy applying for my visa, Jana who I never got a chance to meet helped with my invitation letter in a matter of mins once I'd paid/sent my documents through. Olga is very helpful and knowledgeable about Minsk. She was quick to give assistance anytime I asked. She treats guests with great respect and is a credit to Viva hostel.Cheers! Nastia and Anne were very friendly, even the rest of the staff. Good cleaning and very good atmosfere. Staff is super sweet and helpful, Karina recommended us a great Georgian restaurant. Bunk beds were a little old but everything was clean. Location is just 10 minutes from central train vokzal if you walk over the rails (nobody cares if you do). Remember your slippers/тапочки. Belarus is a country reinventing itself after many years of communist rule. Lined with ornately decorated buildings alongside wide boulevards to welcome the west. The city is meticulously clean, the people are fashionable and classy, navigation is user friendly, and for non Russian speakers... English is spoken amongst many. The lovely staff is what makes this hostel! Ladies that run the place speak english and I really enjoyed getting to know them. Unfortunately the hostel itself is in desperate need of renovations. The rooms were fine, however the 'common room' was a tiny space in reception with fold-out chairs and the kitchen was a bench in the hallway with a microwave. This didn't inspire any atmosphere or comfort. Owner really needs to put some money and love into the place. But thanks ladies, you all rock! The staff spoke English which isn't common in Belarus. There was not much of an atmosphere there as everyone sat around watching the tv. The girl at the front desk got angry at us who were in the common area talking at 10:30pm because others were sleeping but most people in the hostel were in the common room. 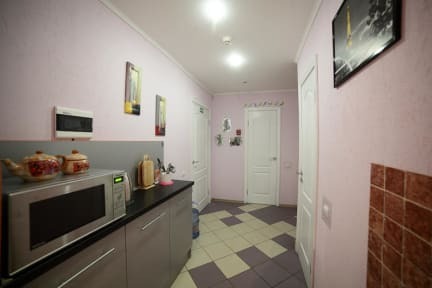 The kitchen is pretty much a hall with a microwave. I only used one of the two showers but the curtain would not stay up on the holder and I spent more time trying to fix it than anything. they don't have enough plug in the room. they have two toilets, one of them is quite disappointing. The location is not that convenient to the city. Not quite worth the money compared to the living cost in Belarus.